1. Law. the crime of willfully inflicting a bodily injury on another so as to make the victim less capable of self-defense or, under modern statutes, so as to cripple or mutilate the victim. 2. random or deliberate violence or damage. See that third definition? The one in bold print? Yeah, I’ve got a lot little of THAT going on mentally today. It’s not yet 11am and I have already started and walked away from at least ten different tasks. While loading the dishwasher I noticed a dish towel that needed to go to the laundry room. Tossing the towel in the laundry room I realized I had not yet folded the clothes I dried last night. Attempting to clean my bathroom I picked up a pair of yoga pants. After putting away the yoga pants I spotted the basket of clean laundry at the foot of my bed. Before I could empty the basket I realized that Seth only had an hour before his BCBA arrived and I needed to get him to knock out an exam. So…. Half of my dishes are in the dishwasher. Half the clean clothes are folded. My bathroom is not quite half clean and there is a half-empty basket of laundry at the foot of my bed. Get the picture? My counselor said I may be ADHD. I don’t think she knows what she’s talking about. While wrestling with my own God-abandonment, I ran into a local Christian bookstore that was going out of business. The place was a mess and I didn’t feel like digging so I just grabbed a couple of things that were on top of piles and left. 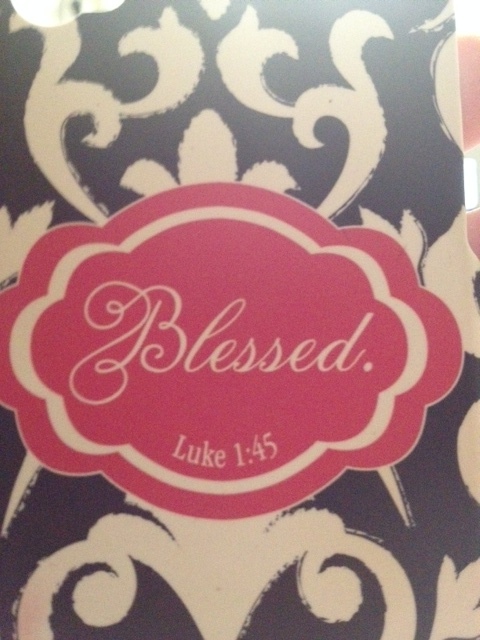 One of those things was a new phone case that says, “Blessed”. As I was putting the case on my phone I spotted the fine print…. I may have trouble conquering my to-do lists, but God never has trouble conquering His. Just by believing that God will do what He says, we are blessed. I may be just a little ADHD.